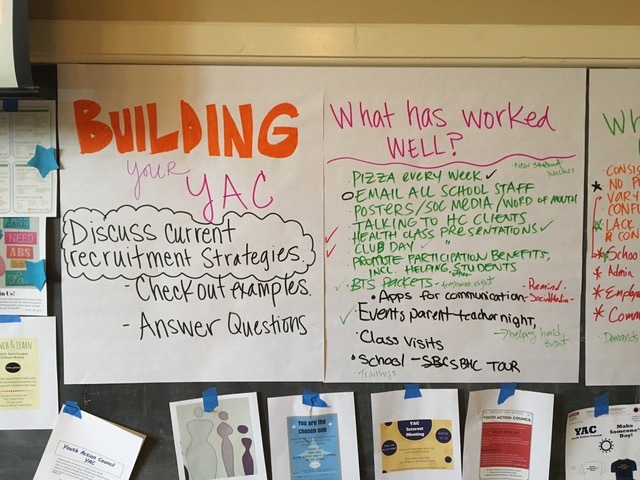 I recently worked with the Oregon School Based Health Alliance to develop and facilitate a training to build capacity for staff that coordinate youth action councils or school health action councils (YACs or SHACs). The work is funded through the Oregon Health Authority’s School Based Health Center (SBHC) State Program Office. The funding is focused on mental health, and each YAC/SHAC works to raise awareness of their school’s school-based health center and implement a participatory action research project around mental health. 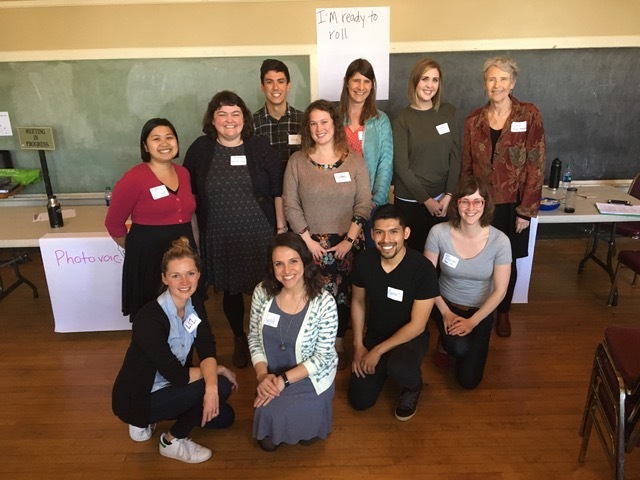 Coordinators from across Oregon came together for two days to learn, share, and connect! They brought so much wisdom, energy and great strategies for working alongside young people. Youth- adult partnerships are about sharing power with young people. It occurs along a spectrum from zero youth involvement (they are a “vessel”) to total youth control (like youth led grass roots organizing). There’s a sweet spot in the middle where adults and youth share power. Adults may provide the connections, opportunities to build skills (like public speaking, research, writing), help keep everyone on the same page and organized, and help navigate obstacles but young people are making the decisions and leading the work. If you are interested in learning more about youth-adult partnerships, check out a webinar I co-facilitated with Haylee, the Student Health Advocate Coach for the Oregon School Based Health Alliance here http://osbha.org/blogs/ashleyosbhaorg/intro-youth-adult-partnerships-webinar . Below are some of the best practices for building youth-adult partnerships adapted from research and practice, as well as some reflections from the training. 1) Pay attention to logistics and group dynamics. Young people have complicated lives and they need flexibility. Ensure you have many different ways young people can be involved that elevate different skills, interests and personalities. For example, you might have someone who is interested in graphic design but can’t make your meetings. Could they work on marketing materials or an infographic and keep connected through communication platforms like GroupMe, SLACK, or Google Hangout? How often does the group meet? Are there barriers that keep a diverse array of young people from being able to participate (like transportation)? 2) Creating opportunities for reflection. These can be formal or informal, and individually or as a group. Some of the benefits of youth adult partnerships come from young people creating connections with a supportive adult, their peers, and having a stronger connection to their community or school. Holding space for reflection and relationship building is critical (and particularly related to number 3). 3) Affirmatively address issues of role and power. This is a BIG one, and one that our training participants agreed could have been the whole focus of our training! Many of the “systems” (schools, local or state government, etc.) are not built to effectively partner with young people. Plus, many adults in those systems are probably not used to working with young people in a partnership capacity. As young people work together to create change in their community they will inevitably: 1) run into obstacles that will delay or derail their plans and 2) confront issues of inequality, oppression, stigma or “isms”. It’s vital that young people are supported to identify the power brokers or points of leverage in their system/community and get them on board. When obstacles do arise, the coordinator or adult ally has to hold space to be able to help facilitate the likely anger and frustration into a new path forward. Having a strong group process, team building opportunities, and time for reflection with thoughtful facilitation can help support young people as they critically examine all the things that influence them, their families, neighborhood and community. This week, Jamie Sparks and I co-facilitated two sessions of the Urban School Wellness Coalition convened by Action for Healthy Kids. This Coalition, comprised of thirty large urban districts came together in Denver to network, share stories, gain knowledge around Wellness Policies, the WellSAT, Every Students Succeed Act (ESSA), Whole School, Whole Community, Whole Child (WSCC) and observe WSCC in action at a local school! Jamie and I spent about 90 minutes Tuesday afternoon on ESSA. We introduced the federal legislation, including key Titles for those unfamiliar with it, shared Cairn Guidance's State ESSA Analysis, and allowed district participants time to review their states' analysis to determine opportunities and challenges within their districts as they move ahead. Yesterday, we spent the morning on WSCC- introducing the framework, sharing effective practices around the school health approach, systems thinking; systems changing, creating buy-in and addressing resistance and brought participants through a variety of engaging activities in order for districts to essentially begin to see how ESSA and WSCC, advocacy, support, implementation are feasible and achievable at home! We created and share our ESSA/WSCC Symbaloo page- a page that showcases the most current, helpful resources in the school health field. Feel free to share with your colleagues. We were honored to have the chance to network, socialize, share, train education leaders around the country this week- what a fabulous group truly dedicated to shifting the norms of how we define school success in the United States. 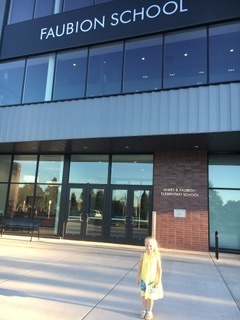 I had been anticipating the grand opening of Faubion K-8 School, in Portland Oregon, this Fall for both personal and professional reasons. Most importantly, it is our neighborhood school. My daughter will be starting kindergarten there next year. As someone who works in school health and public health, the opening of Faubion also embodies so many of the practices we know are effective in supporting the health and academic achievement of young people. A bit of background. Faubion is physically located right next to Concordia University, a private liberal arts college. Concordia has a school of education, and for years they have partnered with Faubion to provide student-teachers with experience in the classroom. Out of this partnership grew 3 to PhD. The first of it’s kind in the nation, the model aims to create safer, healthier and more educated communities from early learning through Pursuing one’s Highest Dreams (PhD). In 2012 a Portland Public School bond was approved that included a rebuild of Faubion because of the strong partnership with Concordia and the 3 to PhD program. And a food club with healthy, organic foods by basics. At the grand opening I heard District, City and State leaders and parents stand up at the podium and speak about the importance of health for students to succeed. I heard them say that if we are to close the achievement gap we need to address the needs of the student, family, and community. This is returning the school as the heartbeat of the community. Partnership. Addressing the needs of the whole child. Involving community partners (parents, business, higher education, health care providers). Preparing the new generation of educators and education leaders to look beyond curriculum and teaching strategies to educate our young people. These are things experts in school health consistently site as the factors that lead to institutionalizing health in education. 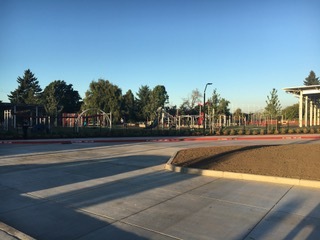 So while the new building is truly amazing (the playground! It has a zip line!) it’s these other factors that inspire and excite me, as a professional, parent, and community member. Kudos to OEA Choice Trust! Their sixth annual School Employee Wellness (SEW) Conference was a huge success. 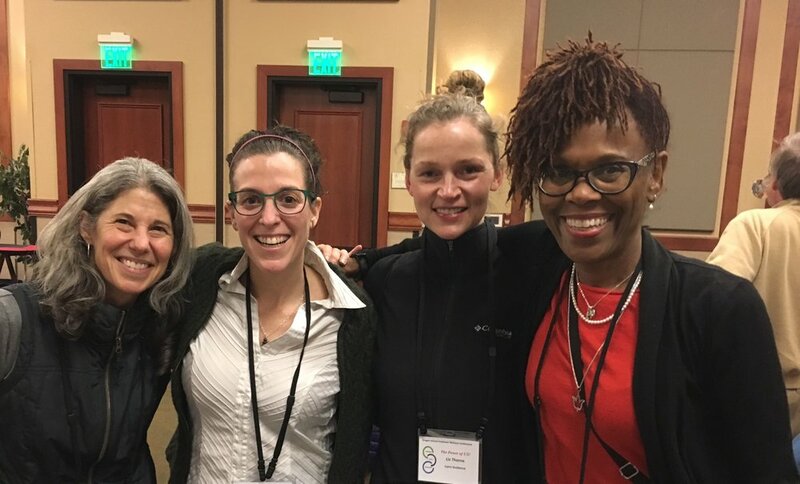 The conference, held in Oregon during spring break, attracts many public health partners, community based organizations, teachers, superintendents, principals, school nurses, human resource directors, and other types of educators that work in school systems. The event is up to 275 participants from 50 their first year! Best part of the SEW conference is seeing colleagues that I've known for over 10 years! This conference does an incredible job of walking the talk. It's held in Bend, a beautiful area of Oregon and each morning prior to opening sessions, group yoga, runs and walks are offered. Mid-afternoon, Zumba, walks, runs, essential oils and healthy snack learning boosts are offered. The food was colorful and nutrient rich. There were times to network, tell your story, connect and find opportunities to find intersections of your work with others. I facilitated two sessions, one on School Health Advisory Committees and their role in sustaining a school health initiative, and, Creating Buy-In and Addressing Resistance for your School Employee Wellness Program. Both were well attended with great participation in activities and rich dialogue. I love being asked to present at this conference for a variety of reasons, but most importantly, I love hearing the stories schools share to create a culture of health for their school staff. The examples of taking care of your employees so that they can do their best jobs with kids, so that they are present, so that they are healthy, and, so they stay in their position (retention). This event is a perfect example of the Whole School, Whole Community, Whole Child Framework in action. Taking one component- employee wellness, but using a coordinated, collaborative approach that engages public health, parents, internal educators, leadership, community partners, grocery stores, gyms, health care systems and policy makers to support one of the most important jobs in this country! The 2015 Bost Health Policy Forum hosted by the Foundation for a Healthy Kentucky kicked off with a welcome from Kentucky's Lieutenant Governor Crit Luallen. She reinforced the importance of economic vitality, livability and strong communities related to the health of Kentuckians. We heard from a variety of health advocates on topics including education, the built environment, worksite wellness and food systems from Andrew Dannenberg from the University of Washington, Vera Oziransky from the Vitality Institute, Mary Gwen Wheeler from 55000 Degrees, and Margo Wootan from the Center for Science in the Public Interest. As 2015 gets its groove on, Cairn Guidance is becoming increasingly busy again after a nice respite during the holidays. Our focus is to continue to develop, revise and implement programs, practices and policies to increase our reach of healthy youth and staff, build sustainable partnerships, diversify our client-base and work, increase our advocacy efforts, model health ourselves and continue to thoroughly enjoy work! I took full advantage of being back in Portland for the third time in 3 months, this time at the American School Health Association Conference. Being that I just moved from there to Kentucky less than a year ago, there were plenty of people to connect with, but I focused on my own professional development and networking while in downtown Portland. This past Saturday, I helped coordinate, facilitate and keynote an event with Prince Georges County Public Schools (PGCPS), the 19th largest school district in the country. We were fortunate to have three essential organizations represented. Yesterday, I was invited to an event that began with a wonderful reception at the Maxwell Place, residence of Drs Eli and Mary Lynne Capilouto (President and his wife) on the University of Kentucky's campus. The University of Kentucky (UK) hosted the KY Leadership Summit on Childhood Obesity in partnership with Kentucky Youth Advocates and Foundation for a Healthy Kentucky and with support of a health policy grant from the Centers for Disease Control and Prevention. The Summit kicked off after the reception with opening remarks from Dr. Steven Wyatt from the School of Public Health at UK and Terry Brooks, Executive Director at Kentucky Youth Advocates. They both did a good job of framing the day… why we were there and what they hope we would accomplish by the end of the day. We were a selected group of organizations and individuals (about 50 people total) in attendance and they hoped we would come to consensus on 3 action items for next steps to address childhood obesity in the Commonwealth. — David Jones, Jr, Jefferson County Public Schools Board of Education Member, Humana Board of Directors and Chairman of Chrysalis Ventures. Bill Goodman from Kentucky Education Television interviewed David Jones, representing the Board of Education for Jefferson County Public Schools. David was the Chair of the Humana Board (in which he is still a member) and runs a venture capitalist, Chrysalis Ventures that funds innovative health and technology projects. David suggested that in Kentucky we are fortunate to have a lot of green space, where farmers markets and community gardens may continue to flourish. However, in the urban settings, which he called vertical cities, green space is few and far between. The key to change is using science, knowledge and marketing skills to change the food industry. With Yum! Brands located in Kentucky, we have an opportunity to work with them, not against them, to change the landscape in our communities. They have the skills, brain power and background in the engineering of food in which we can tap into to create healthier communities. David would like to see more education, as he views education to be a direct correlation to health. He also believes we need to change the price of calories, making the nutrient-rich choice the more affordable one. After the morning interview with David, there were 4, 10 minute TED-style talks given by Dr. Leon Mooneyhan, CEO from Ohio Valley Educational Cooperative, Dr. Heather Erwin, Director of Graduate Studies at UK, Dr. Tom Shelton Superintendent, Fayette County Schools and Jamie Sparks, Director of Coordinated School Health, Kentucky Department of Education. Highlights include Heather discussing the research behind how implementing Comprehensive School Physical Activity Programs (CSPAP) does NOT decrease academic achievement. She went on to discuss the links between health and academic achievement. Tom Shelton talked about how schools sometimes implement silent lunch and take away recess or use physical activity as a punishment. Tom asked, "Who are you trying to punish? The teacher or the kid?" Jamie talked about how in school health we keep trying to find more water to put out the fire versus actually addressing the issues. "We need to get to a point where PE and Health Education is a normal part of the school day. Obesity is a river with lots of contributaries. There are many moving parts." Jamie went on to say that racial, disability and gender inequities were not created within school environments. They were bigger social issues in which schools addressed and became agents of change. Obesity is no different. Schools, as entire communities should address the issue. In the afternoon, there was an expert panel facilitated by Bill Goodman and included Julie Brackett, VP of Advocacy at the American Heart Association, Dr. Heather Erwin, Director of Graduate Studies at UK, Dr. Stu Silverman, ED at Prichard Committee for Academic Excellence and Dr. Susan Zepeda, CEO Foundation for a Healthy Kentucky. I currently do contract work with the Foundation for a Healthy Kentucky and was thrilled to hear Susan discuss how philanthropy/Foundations can help support and address the issue of childhood obesity within schools. She reminded us how the norm should be creating healthy environments and how we all need to model healthy behaviors. We did it with tobacco. We were then assigned into break out groups to discuss what the ONE next step we would like to see to address childhood obesity within school environments in the Commonwealth. It was wonderful to hear Wilson Sears from the Kentucky Association of School Superintendents say, "Put a certified PE teacher in every school." My break out discussed building awareness, who the right influencers are to build awareness, fitness measures for schools and increase community engagement. Each of the 3 break out groups came to consensus on their top three ideas and from there, all 9 ideas were distilled to three. The three big ideas will be around support and professional development to educators (builds awareness), community and school partnerships and policy. Next steps include workgroups to being strategic planning to implement some of the ideas we discussed in the initial meeting. Susan Zepeda encouraged us all to model healthy activities. Proud to say the day ended with a gorgeous bicycle ride in Mammoth Cave National Park with Jamie Sparks and Stephanie Bunge from the Kentucky Department of Education while traveling from this event in Lexington to Bowling Green for another school health event the following day! Jess Lawrence, Stephanie Bunge and Jamie Sparks enjoying a bike ride after the event! I'm here! It's gorgeous. 4 months ago when Susan Berry at the Maine Department of Education contacted me about working with them again at the end of June at Sugarloaf Resort, how could I say no? I arrived at 2pm today, took a hike part way up a ski mountain I haven't been to since high school. No joke, this place is in the middle of Maine. It took about 4.5 hours to drive here from Boston this morning. The weather is perfect and it's nice to be here a little early. Since I'm here for the entire 3-day conference, Susan and I worked together to determine a few opportunities for me to participate in the conference. This conference has been held for 29 years (!) and focuses on school employee wellness. So, tomorrow is the first day and I'll be facilitating the opening energizer to get school teams acquainted and another activity to get the entire group of participants engaged in the topics of the week, including personal wellness, school site wellness and partnership development. Wednesday I will be the opening keynote for the day and Thursday I'll be facilitating a workshop called, "Honing your Stairway Speech" which allows participants opportunities to practice advocacy skills around school health issues. I hope to get some networking time in while kayaking, hiking and enjoying the amazing views from beautiful Maine!